Banding not your thing? Maybe a Baumeister Tying machine is more your style. For gently bundling, binding and strapping sensitive products or for tying heavy products securely and tightly. 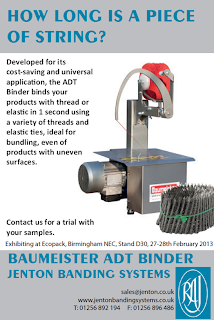 The Baumeister ADT – Tying machine is also ideal for bundling, binding and strapping products with uneven surfaces. A real cost saver, binding products with a thread in a second! 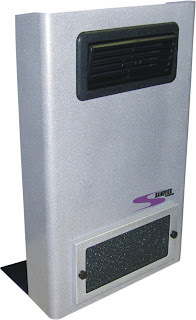 Did you know that Jenton distribute the Sanuvox range of UV air treatment systems? We are proud to announce that we have produced our first two food automation Convergers equipped with controllers programmed with the Russian language. Did you know that Jenton are rather more than ‘normal’ distributors.... At Jenton we have 26 granted patents and 17 patents pending in the fields of packaging, UV Air and Surface disinfection and instrumentation. We have an active R&D Dept. which has received a number of awards and 4 PhDs on the payroll – not bad out of a staff of 25. How does that benefit our customers? We have the ability to analyse customer requirements and the capability to specify, design or make the right solutions for them. We have a wide range of equipment we have designed and made here at Jenton in operation all around the world and we can draw on our resources to solve problems that ‘normal’ distributors just couldn’t do. Try us!